Ten artists and writers. One theme to bind them. Marcel Aubron-Bulles - The Tolkienist and Robert S. Malan. 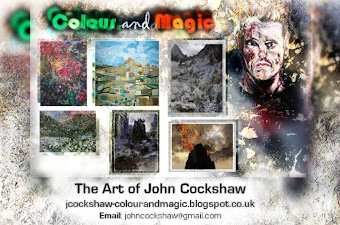 After an intensely busy four-month period of planning I can now proudly announce that my second exhibition as curator (in addition to artist) has opened. In fact, it has open for just over ten days at the time of writing. 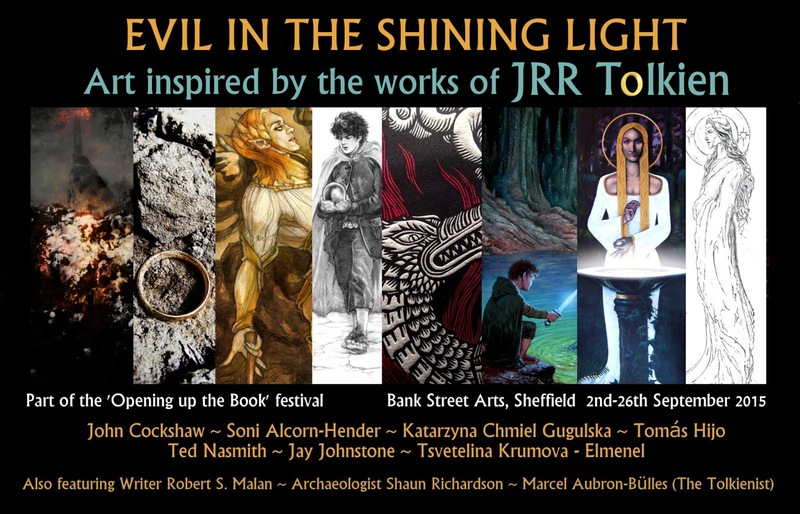 EVIL IN THE SHINING LIGHT: ART INSPIRED BY THE WORKS OF JRR TOLKIEN presented an ambitious project for me to oversee from its very conception. It began as a proposal in response to a call for contributors from Bank Street Arts in Sheffield for their biannual book-arts festival 'Opening up the Book'. Conceived as a two-part exhibition curated over two gallery rooms it ended up comprising three interlinked parts - and if ever there was an opportunity to try something brave and conceptual this was certainly it! 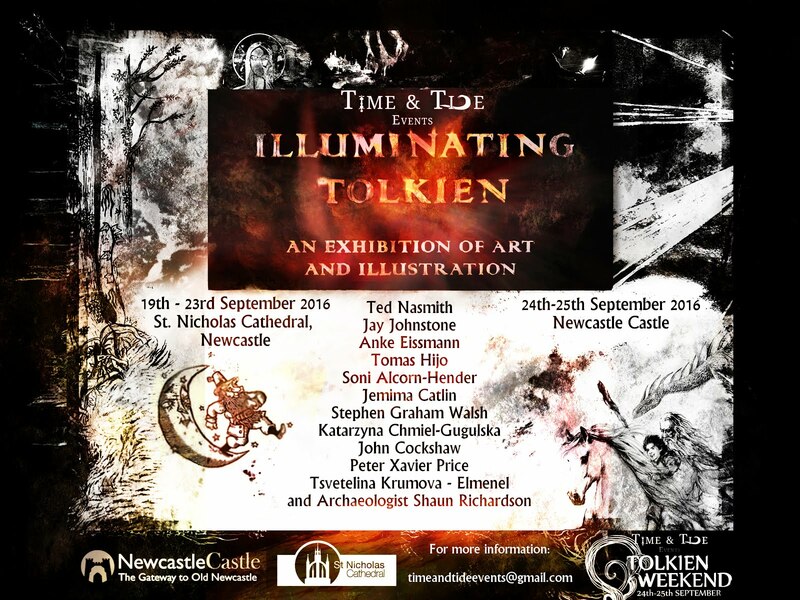 The JRR Tolkien-inspired element of the exhibition mainly took place in a single gallery (Gallery 2 of Bank Street Arts) and featured a collective of exciting Tolkien-inspired artists working in varied media and all delving into Tolkien's Middle-earth writing to produce unique interpretations. What is more, each artist was working to a double theme and brief; 'Evil in the Shining Light' and 'Opening up the Book'. Being as open a brief as that was, it resulted in some startlingly original new work alongside existing artwork from the back catalogue of those involved. Those involved (joining myself) were Soni Alcorn-Hender, Tomas Hijo, Katarzyna Chmiel-Gugulska, Jay Johnstone, Tsvetelina Krumova - Elmenel and Ted Nasmith. Joining these artists were contributions from German writer Marcel Aubron-Bulles (aka The Tolkienist) and some inventive archaeological drawings referencing Weathertop by Archaeologist Shaun Richardson. 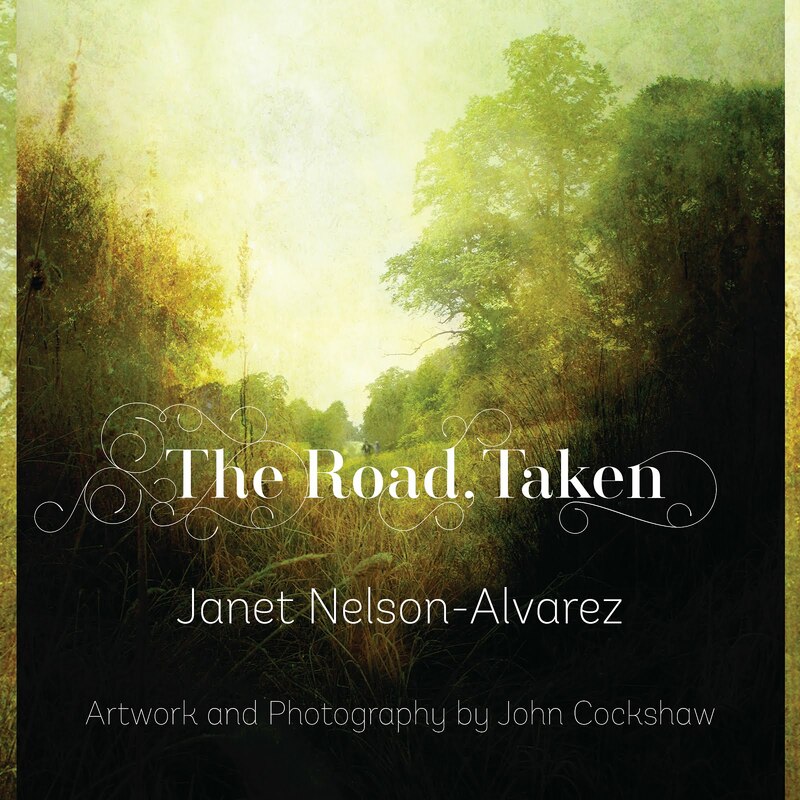 The interpretation of the title, and indeed the reason it was chosen, draws very much on its far-reaching quality; with it serving as a beginning from which many diverging threads may lead. The presence of Sauron and the One Ring is evident in many pieces, as is Smaug in addition to implying the wretched motivations of Gollum but there is also the suggestion of danger/evil in other inanimate objects such as Galadriel's mirror of the Palantir discovered by Pippin at Isengard. Also a theme of the exhibition is the threat of evil encroaching upon seemingly safe havens or the awesome and formidable power of nature, and also extended by referencing the actions of those who seek to counter the forces of evil; specifically Aragorn and Gandalf, the hobbits and Treebeard. The second element of the exhibition (Gallery 3) broadens scope to include a video screening of THE SIGN OF THE SHINING BEAST by writer Robert S. Malan and John Cockshaw. This project, whilst exploring its own concerns of fractured narrative and the book forms of the graphic novel/ photo-roman, does possess a connection to Tolkien through its dream-like visual aesthetic in that it presents a series of hazy yet lucid visions to the viewer in the same vein as Galadriel's mirror or the aforementioned Palantir seeing stone. Much of the imagery in the video does present the occasional allusion to scenes from The Lord of the Rings but yet much of it is also non-specific and even Sci-fi in reference. A haunting soundtrack and eerie sound design accompanies the video and very effectively seeps into the adjoining gallery where the bulk of the Tolkien art is. Thirdly, and connecting to the aesthetics of the video, its musical/sound design and extending the Tolkien-inspired reference is an exhibit covering one wall entitled ART FOR ASCENSION, DECLINE AND EVIL TIMES. 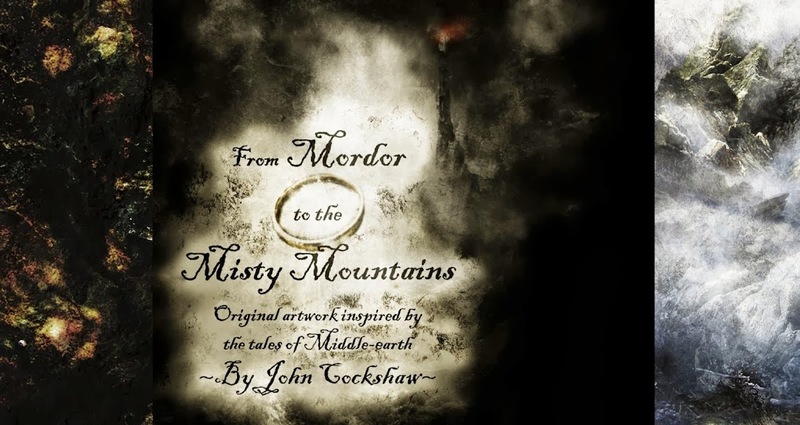 The concern here is a small collection of prints that directly reference and take inspiration from Howard Shore's epic scores for The Lord of the Rings films and the 2010 book that provides a scholarly analysis of these scores by Musicologist Doug Adams. 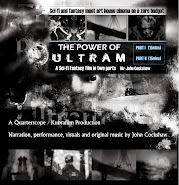 The art and suppporting text included in the exhibition is also acknowledged as first appearing in a two-part article of the same name by John Cockshaw for the film industry's premier film music magazine FILM SCORE MONTHLY ONLINE (Dec-Feb 2014/2015). A feature and article on the exhibition in its finalised form will appear courtesy of The ScifiFantasyNetwork (SFFN) in the coming week or more. A selection of exhibition photos offer a glance of the fully installed show.